A lot of people in the garden world list Powis Castle as their favourite garden. I have at times. I went several times many years ago (like - a long time ago!) but then although it isn't that far I haven't been for ages. Having hugely enjoyed it, I know I shall be going back more. It really is very special. It's that location for one thing, that huge drop down, the view, the horticultural extravagance on one level after another. It's also one of those gardens that makes you feel like you are in a separate, self-contained world where everything is a little more perfect than reality. What always made Powis special was always the half-hardy stuff, always pushing the boat out as to what would work. Jimmy Hancock started all this playing with hardiness zones. He was the previous head gardener, retiring in 1996 And he got a obit in the Times too. 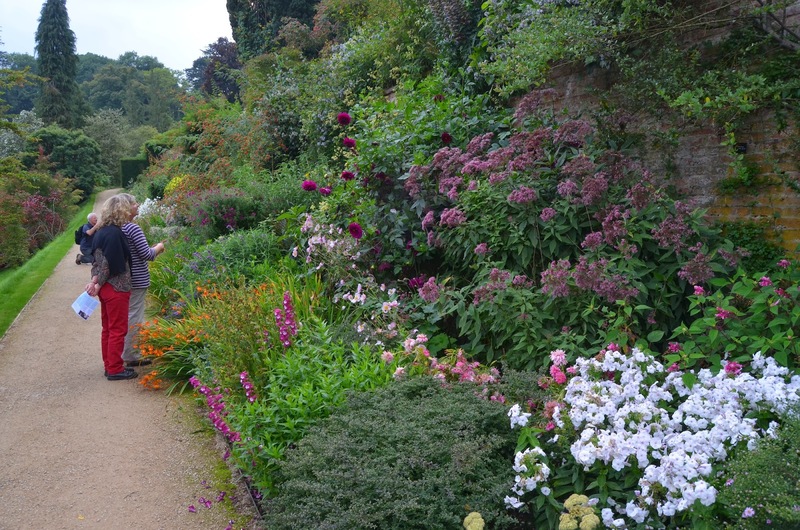 He was one of the National Trust's great head gardeners, always fun to talk to, as he was so full of ideas and knowledge. He obviously had a rather combative relationship with Graham Stuart Thomas, the Trust's Gardens Advisor for many crucial years (1955-75) and by all accounts, rather full of himself. I remember Jimmy telling me some stories of Thomas turning up and telling him what he could do and not do. Jimmy had no time for his advice, which he dismissed as irrelevant, pointing out the climatic differences between the south-east of England (Thomas's natural habitat) and the Welsh borders. 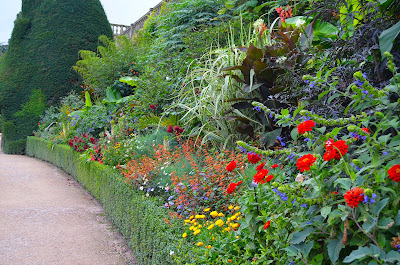 Although Powis is a great garden, full stop, it is the half-hardy planting which has always been the high point. Jimmy's work had been continued and built on superbly by the current team, headed by Gardens Operations Manager David Swanton. 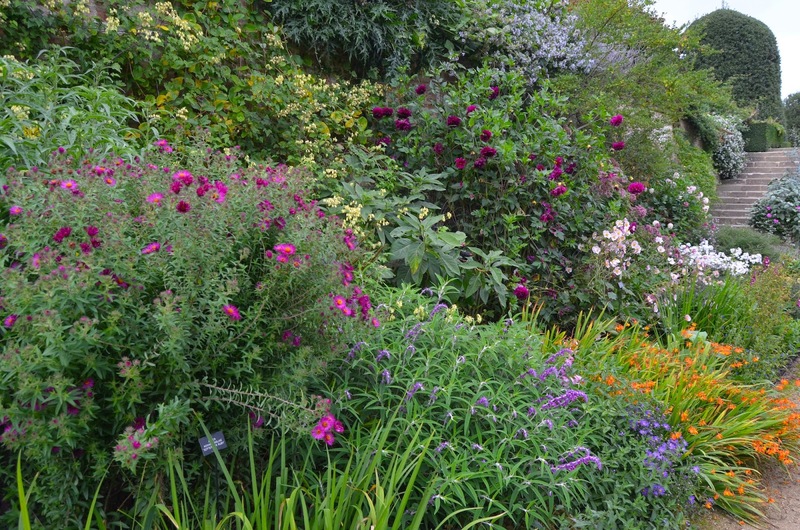 The top slope is now a towering border of half-hardies, almost hardies and hardies which look like not-hardies. It is a triumph. 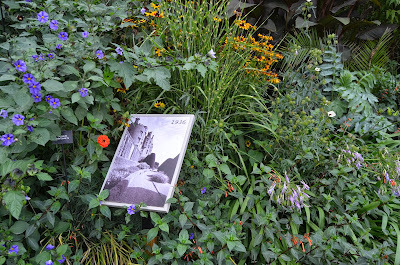 Reproductions of old photographs are dotted around showing you what the garden was like at various points in the twentieth century. Emptier of plants for the most part. The pots here are fantastic, some of the best filled containers I've seen, exuberant, exotic and using a huge range of plant material. 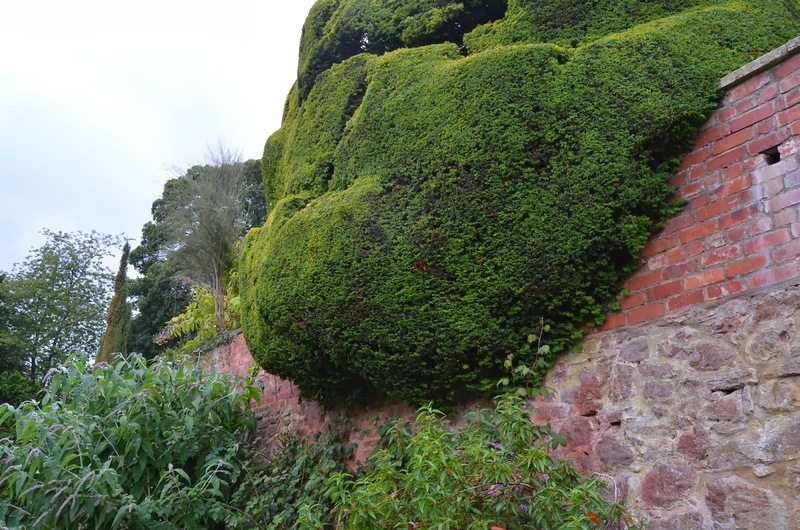 One of the things which gives Powis its really special atmosphere is the sense of antiquity which oozes out of the stone walls, the statues and these extraordinary overgrown yew topiaries. We were slightly of the attitude that they looked a bit too much like obese flesh, and perhaps in need of a little restorative pruning. The 'ordinary' i.e. not full of half-hardies, borders are pretty spectacular too, but very old-fashioned. There is a great deal of traditional support given with canes and twine which must take up a lot of time, and for some plants, like Knautia macedonica just does not work, which led to much thinking on my part as to how I might do things differently, as the frame of a traditional border is very tight. I'd forgotten just how wide a range of plants there are here, very much with a late summer focus. 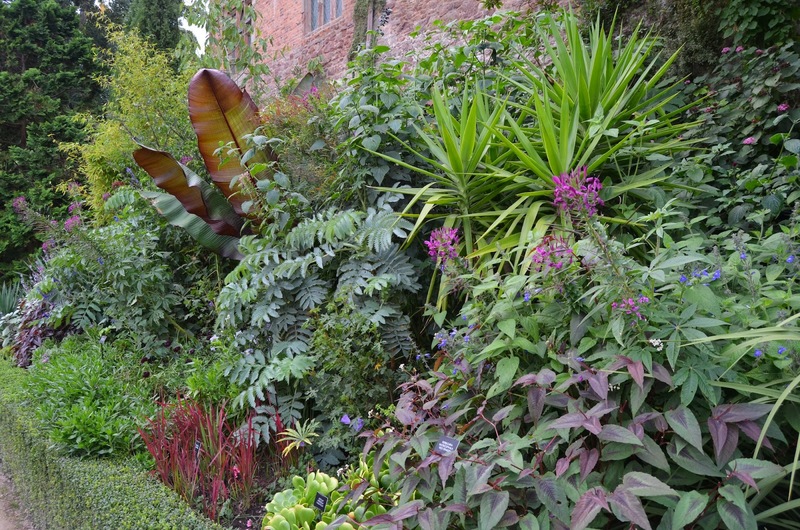 Some of the border plantings are contained within box low box hedges, which is a traditional way, and looks distinctly odd now, makes it look like all those dangerous perennials have to be kept in a cage. Mostly however they spill out over the paths - that was probably quite daring back in the day. This is one of those places that combines innovation (primarily the half-hardies) with traditional skills. 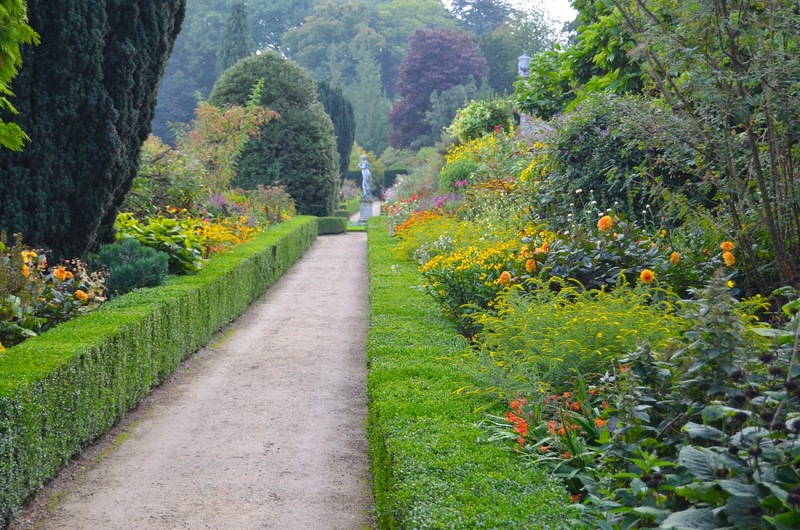 Unlike in Graham Stuart Thomas's day, the garden staff here have plenty of autonomy. It always used to be said that the NT used to make every garden look the same. I was never sure about this, but it certainly is not true now, as there is apparently very little central direction. 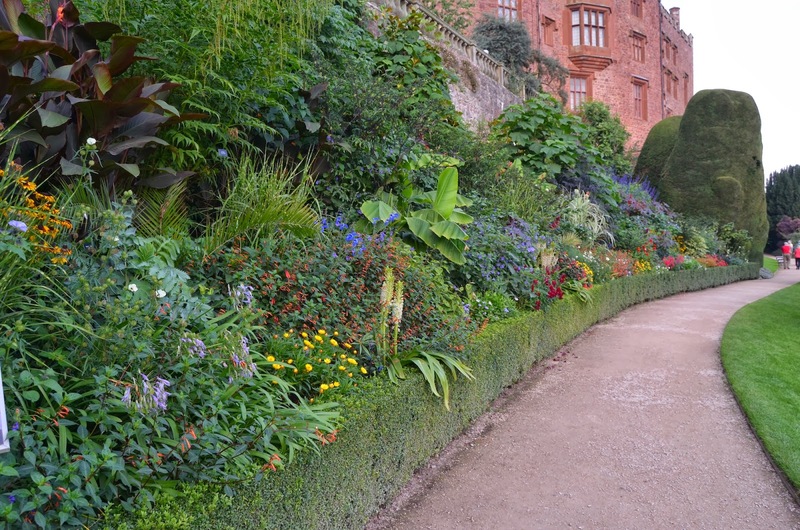 For new ideas it can only be good, and it was new ideas that put Powis Castle on the map and made it such a favourite. I had forgotten how fantastic Powis is. I love the use of tender plants and to hear how over the years they have pushed the boundaries. 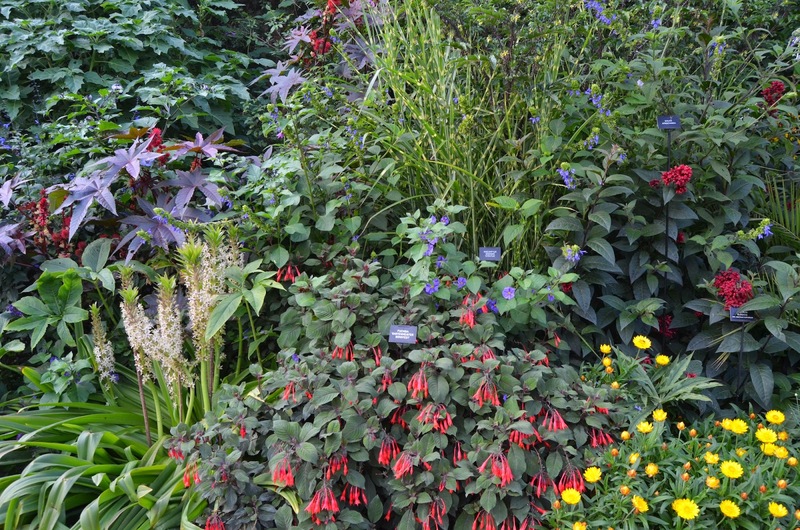 I knew two National Trust garden advisors and admired their work but I do agree that their gardens should have a degree of autonomy. Perhaps nowadays NT gardens generally get too little authoritative advice? 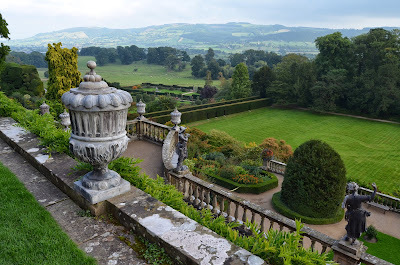 Ihavent been to Powis for 6 or 7 years and then early in the year so I think I will make sure I visit next year as I am no further from it than you. I visited Powis for the first time in June this year on a rainy day. The weather didn't detract, indeed may have added to the experience. 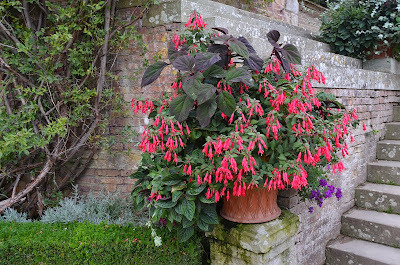 I was overwhelmed by the plantings, the setting and the atmosphere. Definitely a place to return to. Thank you for sharing this. I have only seen this garden in photos and yours are particularity beautiful. The first thing that struck me is the sense of mastery of color moving through the long borders. It's not easy using white & yellow and red but it is done with such skill. I agree about the old yews giving the garden a weight and sense of age. Thanks for sharing.